The goal of this pilot study is to use complementary MRI strategies to quantify and relate cerebrovascular reactivity, resting cerebral blood flow and functional connectivity alterations in the first week following sports concussion in college varsity athletes. Seven college athletes (3F/4M, age = 19.7 ± 1.2 years) were imaged 3–6 days following a diagnosed sports related concussion and compared to eleven healthy controls with no history of concussion (5M/6F, 18–23 years, 7 athletes). 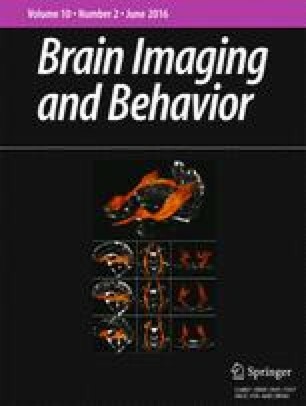 Cerebrovascular reactivity and functional connectivity were measured using functional MRI during a hypercapnia challenge and via resting-state regional partial correlations, respectively. Resting cerebral blood flow was quantified using arterial spin labeling MRI methods. Group comparisons were made within and between 18 regions of interest. Cerebrovascular reactivity was increased after concussion when averaged across all regions of interest (p = 0.04), and within some default-mode network regions, the anterior cingulate and the right thalamus (p < 0.05) independently. The FC was increased in the concussed athletes within the default-mode network including the left and right hippocampus, precuneus and ventromedial prefrontal cortex (p < 0.01), with measures being linearly related to cerebrovascular reactivity in the hippocampus in the concussed athletes. Significant resting cerebral blood flow changes were not detected between the two groups. This study provides evidence for increased cerebrovascular reactivity and functional connectivity in the medial regions of the default-mode network within days of a single sports related concussion in college athletes. Our findings emphasize the utility of complementary cerebrovascular measures in the interpretation of alterations in functional connectivity following concussion. This work was supported in part by Vanderbilt CTSA grant UL1 TR000445 from NCRR/NIH (Morgan). Adam R. Militana, Manus J. Donahue, Allen K. Sills, Gary S. Solomon, Andrew J. Gregory, Megan K. Strother, and Victoria L. Morgan declare that they have no conflict of interest. All procedures performed in studies involving human participants were in accordance with the ethical standards of the Vanderbilt University and/or national research committee and with the 1964 Helsinki declaration and its later amendments or comparable ethical standards. Informed consent was obtained from all participants included in this study.